For persons interested in the preservation,collection, exhibition and redistribution of artifacts from our photographic heritage. P.C.H. SPONSORS TWO SHOWS EACH YEAR THAT ATTRACT DEALERS WORLDWIDE. MORE THAN 185 TABLES FOR USABLE AND COLLECTABLE CAMERAS, ACCESSORIES,PHOTOGRAPHIC LITERATURE AND IMAGES! 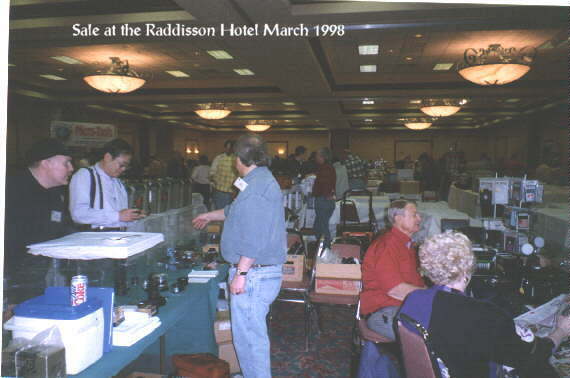 OUR 46TH SEMI-ANNUAL SHOW AND SALE WILL BE SATURDAY AND SUNDAY SEPTEMBER 25TH & 26TH, 1999 AT THE RADISSON HOTEL & CONFERENCE CENTER-HOBBY AIRPORT EXIT #36- (9100 GULF FREEWAY) AT THE AIRPORT EXIT: TEL. 713-943-7979. OPEN TO THE PUBLIC 10 A.M. TIL 5 P.M. EACH DAY. FOR MORE INFO OR TABLE RESERVATIONS CONTACT LEONARD M. HART, SHOW DIRECTOR, P.O. BOX 70226, HOUSTON ,TX. 77270-0226;-713-868-9606. 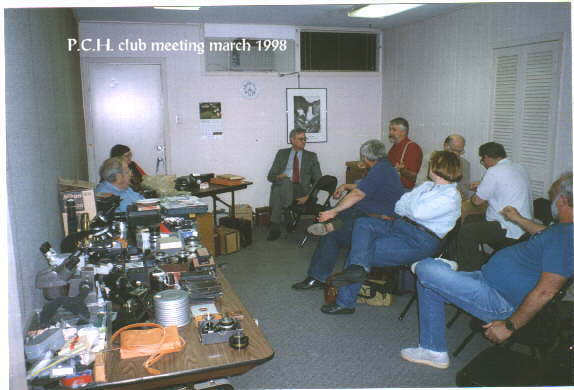 OUR CLUB MEETS EACH FOURTH WEDNESDAY OF THE MONTH AT PROFESSIONAL CAMERA REPAIR-4410 RICHMOND AVE. HOUSTON TX. .77027. P.C.H. MEMBERSHIP IS $20.00 ANNUALLY. BENEFITS INCLUDE THE MONTHLY NEWS LETTER EDITED BY SUSAN HART AND ADMISSION TO THE SHOWS PLUS DISCOUNTS ON TABLES AT THE SHOW . CLUB MEMBERSHIP IS MORE THAN 125 MEMBERS FROM THE U.S.A AND SEVERAL FOREIGN COUNTRIES. Our club officers are : President- Susan Hart-Vice president / Program Chair-Al Iverson-Treasurer/Show director -Leonard Hart- Membership Chair-EVERYONE! Try to sign someone up this year!-Editor/Show Publicist-Susan Hart. Welcome to our shows and meetings! Show admission each day $5.00 or $4.00 with discount coupon. Mentioning seeing this internet page at the show door will also get the $4.00 admission fee. LIST OF PCH MEMBERS WITH PAGES ON THE NET AND OTHER PHOTOGRAPHY RELATED LINKS. WALKER MANGUM - KODAK COL.
< font>ALLEN MATHESON'S HOME PAGE-PHOTOGRAPHY AND INFO. "TIPPER" GORES' PHOTOGRAPHY PAGE-"IN FOCUS"